The urokinase plasminogen activator receptor associated protein (uPARAP)/Endo180 is a novel endocytic receptor that mediates collagen uptake and is implicated to play a role in physiological and pathological tissue-remodelling processes by mediating intracellular collagen degradation. This study investigates the expression of uPARAP/Endo180 protein and messenger RNA in primary rat hepatic stellate cell (HSC) cultures. The results show that uPARAP/Endo180 protein is not expressed in freshly isolated HSCs or during the first few days of culture while the cells still display quiescent features. In contrast, uPARAP/Endo180 protein is expressed early during HSC activation when cells are transdifferentiated into myofibroblast-like cells. Very low levels of uPARAP/Endo180 mRNA are detectable during the first days of culture but uPARAP/Endo180 mRNA is strongly up-regulated with increasing time in culture. Moreover, endocytic uptake of denatured collagen increases as transdifferentiation proceeds over time and correlates with increased expression of uPARAP/Endo180. Finally, analysis of uPARAP/Endo180 expression in four hepatic stellate cell lines from three different species showed that all these cell lines express uPARAP/Endo180 and are able to take up denatured collagen efficiently. These results demonstrate that uPARAP/Endo180 expression by rat HSCs is strongly up-regulated during culture activation and identify this receptor as a feature common to culture-activated HSCs. The urokinase plasminogen activator receptor associated protein (uPARAP)/Endo180 (also known as CD280; referred to hereafter as Endo180) is an endocytic receptor which together with the mannose receptor, the M-type phospholipase A2 receptor and the dendritic cell receptor DEC-205 constitutes the mannose receptor family of C-type lectins [1–3]. Endo180 was discovered as a constitutively recycling receptor of unknown function with a molecular mass of 180 kDa , and subsequently identified as a transcript of a gene encoding a novel member of the mannose receptor family of C-type lectins . It was later recognized as a collagen-binding receptor and was referred to as urokinase plasminogen activator (uPA) receptor (uPAR) associated protein (uPARAP) because of its ability to form a ternary complex on the cell surface with uPA and its receptor uPAR . Further work has established that Endo180 can act as an endocytic receptor to mediate the uptake and degradation of both native and denatured collagens through clathrin-dependent endocytosis. Endo180 may have a role in the catabolism of extracellular matrix (ECM) collagen [7–15]. Recent studies suggest that Endo180 can also exert functions beyond endocytosis of collagen including cell-matrix adhesion and cell migration [8, 14, 16, 17]. Hepatic stellate cells (HSCs), located in the space of Disse, are the main storage site for vitamin A (in the form of retinyl ester-containing lipid droplets) in the body and they also contribute to the production of ECM proteins [18–20]. In normal liver, HSCs are essentially quiescent, but have the ability to transdifferentiate into myofibroblast-like cells in response to liver injury during a process termed "activation" . Liver injury can occur as a consequence of a wide variety of causes including T cell-mediated response to viral infection, toxic metabolites from ethanol metabolism, and autoimmune hepatitis [21–24]. Activation of HSCs represents a key process in a wound healing program initiated in response to such injuries. Responding to paracrine stimuli such as transforming growth factor-β1, platelet derived growth factor, insulin-like growth factor and/or to material released from necrotic/apoptotic hepatocytes, quiescent HSCs undergo changes in gene expression, down-regulating genes involved in the preservation of the quiescent state while up-regulating genes that promote HSC myofibroblastic functions and thereby hepatic tissue remodelling. They acquire a fibrogenic phenotype leading to enhanced production and secretion of ECM components. They also produce and secrete matrix metalloproteinases (MMPs) that degrade excess of ECM and inhibitors that limit the action of MMPs. Moreover, HSCs loose their vitamin A contents and acquire myofibroblastic properties including contractility which are important for vasoregulation and wound closure [21, 25–30]. Culturing of HSCs isolated from normal livers on tissue culture plastic will also cause activation of quiescent HSCs and their transdifferentiation into proliferating myofibroblastic cells, features similar to those observed in HSCs activated in vivo [31, 32]. We have previously shown that Endo180 expressed by culture-activated rat HSCs is the main receptor in these cells mediating endocytosis of denatured collagen . In this report, we used this cell culture system to investigate the expression of Endo180 in the primary culture of rat HSCs to see whether Endo180 is expressed constitutively by quiescent HSCs or if it is a component in the transdifferentiation program that is induced during the course of the activation process. After 40 hours in primary culture, the cells showed homogeneous stellate morphology with extended long processes. Oil Red-O staining showed that more than 98% of cells possess variable amounts of lipid droplets and clear nuclei (Figure 1A). All of these features are considered as phenotypic landmarks of the majority, but not all, of quiescent HSCs . After 3–4 days of culture, the cells exhibited heterogeneous morphology suggestive of activating HSCs, e.g., cells in the transition from the quiescent to activated phenotype (not shown). After 6–7 days, lipid droplets were less abundant and most cells adopted morphology typical of activated HSCs: large, spread out, polygonal morphology similar to myofibroblastic cells (Figure 1B). Most cells sub-cultured for 5 days displayed myofibroblastic appearance and were devoid of lipid droplets (Figure 1C). Light microscopic analysis of HSCs stained with Oil Red-O at different stages of transdifferentiation in primary culture. (A) Representative micrographs of HSCs cultured for 40 hours (A), 7 days (B) or sub-cultured for 5 days (C) showing changes in the morphology (from stellate shape to myofibroblast-like cells) and contents of lipid droplets. Note that HSCs cultured for 40 h contain variable amounts of lipid droplets. In sub-cultured (first passage) cells, there were no detectable lipid droplets as judged by Oil Red-O staining (data not shown). Original magnification: ×100. The micrographs shown are representative of cells obtained from at least two different preparations. Cultured HSCs were also characterized by the expression of quiescent and activation protein markers using Western blotting. The intermediate filament desmin is expressed in quiescent rat HSCs and is maintained during activation [34, 35]. Quiescent rat HSCs also express glial fibrillary acidic protein (GFAP), another intermediate filament protein [36, 37], but down-regulate this marker when they transdifferentiate into myofibroblasts [37–41]. In contrast, HSCs in the quiescent state do not express smooth muscle α-actin (α-SMA), a cytoskeletal protein important for contractile activity of myofibroblasts, but induce its expression when they acquire an activated phenotype [42, 43]. In this study, we used these markers to confirm the identity of HSCs during culture activation. As expected, desmin expression was high in freshly isolated cells and significant expression was also maintained in activated state. Expression of GFAP was also high in freshly isolated and activating HSCs but was down-regulated in fully activated cells. Smooth muscle α-actin was absent from freshly isolated HSCs but its expression was rapidly induced during the first few days of culture (see Figure 2A and 2B). Time course analysis of the expression of Endo180 and marker proteins in freshly isolated and cultured rat HSCs. (A and B) Western blot analysis of expression of Endo180, desmin, GFAP, and α-SMA during culture activation of rat HSCs. At the time points shown cells were collected and cell lysates were prepared from frozen cell pellets (A) or cells were lysed directly in lysis buffer (B) and the same amount of proteins was analyzed by SDS-PAGE and Western blot using anti-Endo180 antibody. The blots were re-probed with antibodies to β-actin, used as a loading control, and marker proteins as indicated. Total non-parenchymal cells (NPC) were prepared from rat liver by collagenase perfusion as previously described . (C) Densitometric analysis of Western blots showing the time-dependent increase in Endo180 protein expression in cultured rat HSCs. The ratio Endo180/β-actin bands was quantified for each day and expressed as means ± SD of seven different samples (days 1–5, and 7) or four different samples (days 0, 6 and sub-cultured). Note that there is less beta-actin in the three first lanes in Fig. 2A. However, densitometric analysis of bands showed that the amount of beta-actin at day 3 is ~ twice as much as day 7, yet no expression of Endo180 is observed at day 3. (D) RT-PCR analysis of Endo180 mRNA expression during culture activation of rat HSCs. Total RNA was extracted from cells and Endo180 and β-actin, used as an internal control, mRNAs were analyzed by RT-PCR. One representative experiment (out of three independent experiments) is shown. SC, sub-cultured (first passage). We first examined the expression of Endo180 protein by Western blot analysis using lysates prepared from freshly isolated and cultured HSCs 1–7 days after plating. No band corresponding to Endo180 was detected in lysates from freshly isolated cells and cultured cells during the first three days. However, a band corresponding to Endo180 (approximately 180 kDa) was detectable by day 4 of culture activation, and increased approximately 2-fold in the following two days and remained unchanged thereafter (Fig 2A and 2B). In one of seven separate isolations the 180-kDa band was detected weakly in 3-day cultured HSCs. The human U937 monocytic cell line and non-parenchymal cells prepared from rat liver were used as positive and negative controls, respectively, for the expression of Endo180 (Fig 2B). No bands were detected when a non-specific rabbit immunoglobulin G was used (data not shown). To determine whether the increased Endo180 protein expression was paralleled by increase in mRNA expression, we examined the expression of Endo180 by RT-PCR of total RNA. Very low levels of Endo180 mRNA were detectable in freshly isolated HSCs and cultured cells during the first two days. However, culturing of cells for three days resulted in a strong up-regulation of Endo180 mRNA expression. Maximal up-regulation was observed between days 5 and 6 (Fig. 2D). We previously showed that the polyclonal anti-Endo180 antibody employed in this study is able to inhibit both cell-surface binding and endocytosis of denatured collagen by culture-activated rat HSCs . To determine whether increased expression of Endo180 in cultured HSCs results in increased uptake of denatured collagen, cultured HSCs at different time points were assayed for their ability to take up and degrade denatured collagen. To this end, we used 125I-TC-labeling of denatured collagen, which has the advantage that the released 125I-TC (after degradation of ligand) is trapped in intracellular compartments and both internalization and degradation can directly be measured in cell lysates. The results showed a parallel increase in the uptake of 125I-TC-collagen and expression of Endo180 as the cells became more activated (Fig. 3A). Activated HSCs also showed a significant increase in their capacity to degrade the internalized 125I-TC-collagen from an average 5.1% (of internalized) in 4-day cells to 15% in activated cells (7-day cells) and to 22% in sub-cultured cells (Fig. 3B). Uptake and degradation of denatured collagen by rat HSCs as a function of cell culture time and the effect of inhibitors of lysosomal function on these processes. (A) At each day, cells cultured in 6-well plates were washed, pre-incubation for 45 min at 37°C, and then incubated for 2 h at 37°C with 10 μg/ml 125I-TC-collagen. After washing, cells were lysed to determine total cell-associated radioactivity (= the sum of acid-soluble and acid-precipitable radioactivity), which was taken as a measure of total uptake of 125I-TC-collagen. Acid-soluble radioactivity was taken as a measure of degradation of 125I-TC-collagen. (B) The calculated percentage of internalized 125I-TC-collagen degraded by cells. Results are shown as means ± SD for triplicate wells and represent one of three similar experiments. Data are normalized for cell number. Cells were counted on the indicated days as described in Materials and methods. (C) Sub-cultured (first passage) HSCs were washed, pre-incubation for 45 min at 37°C, and then incubated at 37°C with 125I-TC-collagen for either 30 min in the absence or presence of excess unlabeled denatured collagen (100-fold) or for 2 h in the absence or presence of E64d (100 μM) or concanamycin A (Con A, 1.5 μM). Uptake and degradation were determined as described above. Data represent either average of duplicate determinations (unlabeled collagen) or means ± SD for triplicate determinations (E64d and Con A) and are representative for at least two such experiments performed. Incubation of cells in the presence of a 100-fold excess of unlabeled denatured collagen for 30 min at 37°C resulted in significant inhibition of the uptake of 125I-TC-collagen, indicating receptor-mediated internalization from the cell surface (Fig. 3C). The degradation of 125I-TC-collagen was significantly reduced in E64d-treated cells, by ~67%, indicating the involvement of cysteine proteases in the degradation of internalized ligand. The total uptake was not affected by E64d, indicating that receptor endocytic trafficking was normal (Fig. 3C). Incubating cells with concanamycin A, a drug that inhibits the activity of the vacuolar proton pump, inhibited the degradation of 125I-TC-collagen by ~84%, indicating that degradation of internalized ligand occurs in acidic compartments (late endosomes/lysosomes). However, the total uptake was also reduced, by ~25%, by this treatment (Fig. 3C), probably due to the continuous recycling and re-internalization of ligand-occupied receptors, which prevent them from participating in further rounds of ligand uptake . Taken together, these results suggest that the up-regulation of Endo180 in rat HSCs is associated with an increased ability of cells to take up and degrade denatured collagen. Furthermore, the data suggest that culture-activation of HSCs is associated with an enhanced capacity to degrade the internalized ligand, which may reflect enhanced lysosomal activity. Alternatively, the rate of ligand delivery to lysosomes may be faster in activated rat HSCs than in non-activated HSCs. To see if the expression of Endo180 in activated rat HSCs is restricted to our cell culture system or common to other culture-activated HSCs, we investigated whether Endo180 is present in four established hepatic stellate cell lines from three different species: the human LX-2 cells, the murine HSC line M1-4, and two rat HSC lines, BSC, and MFBY2. As shown in Figure 4A and 4B, Endo180 protein and mRNA are expressed by all of these cell lines. However, the antibody against the Endo180 recognized two bands in the total cell lysate from M1-4 cells, one with a slightly higher molecular weight, probably due to different degrees of glycosylation of the Endo180 protein. Expression of Endo180 protein and mRNA by four established HSC lines from three different species. 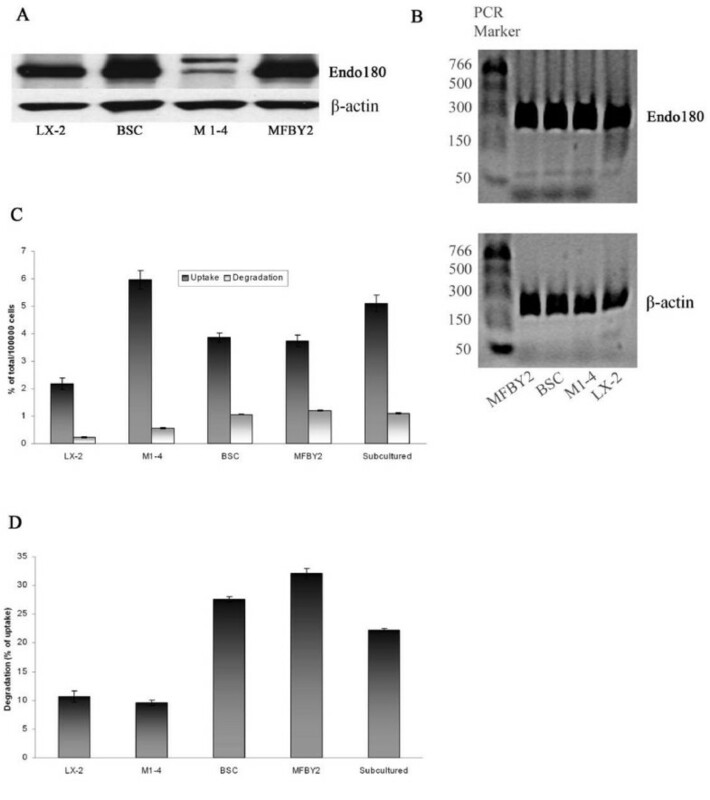 Detection of Endo180 and β-actin proteins (A) and mRNAs (B) was performed as described in Figure 2. Results are representative of three (A) or two (B) experiments. (C) Uptake and degradation of denatured collagen by different HSC lines. Cells were grown in 6-well plates, washed, pre-incubation for 45 min at 37°C, and then incubated for 2 h at 37°C with 10 μg/ml 125I-TC-collagen. Experimental procedure is as in the legend to Figure 3. (D) The calculated percentage of internalized 125I-TC-collagen degraded by different HSC lines. Results are shown as means ± SD for triplicate wells and are representative for at least two similar experiments. Cells used from a new passage was treated as a separate experiment. Data are normalized for cell number. Furthermore, all four of these cell lines were able to take up and degrade 125I-TC-collagen (Figure 4C), although some differences in the endocytic and degradative capacities between these cell lines were noted. The murine M1-4 HSC line was more active in endocytosis and could take up approximately 1.6- and 2.7-fold more 125I-TC-collagen than rat and human HSC lines, respectively, during a 2-h incubation at 37°C. Despite a higher endocytic capacity, the murine M1-4 cells degraded the internalized collagen very inefficiently: only about 10% of the total internalized collagen was degraded by these cells during 2 h, which is comparable to the amount of internalized collagen degraded by the human LX-2 cells. By comparison, both rat HSC lines degraded the internalized collagen with comparable efficiencies; about 30% of the internalized, during the same incubation time (Figure 4D). 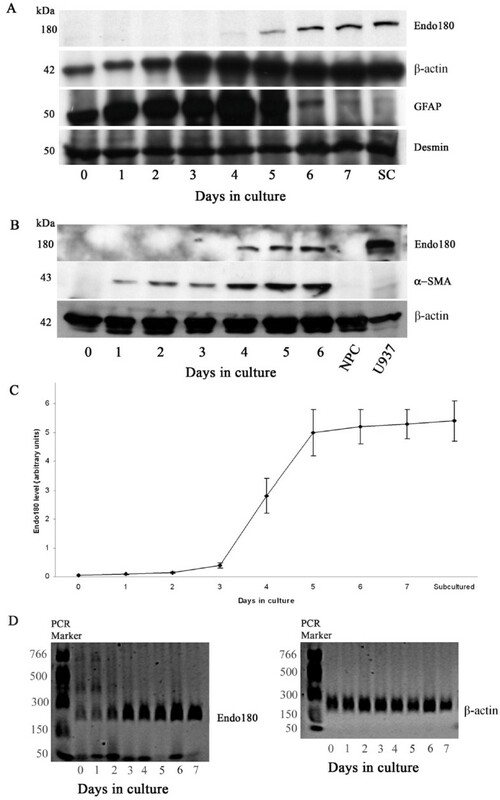 In this study, using primary rat HSCs, we demonstrate that (1) whereas no Endo180 protein expression was observed in freshly isolated HSCs or during the first 3 days of culture, Endo180 protein was consistently detectable after 4 days in culture, and increased further during the following days, (2) low levels of Endo180 mRNA were detectable in isolated HSCs during the first two days of culture. However, a strong up-regulation of Endo180 mRNA expression in cells after 3 days in culture was further enhanced with increasing time in culture, (3) the increase in Endo180 protein levels ran parallel with a corresponding increase in HSC uptake of denatured collagen, (4) activation of rat HSCs was associated with enhanced degradation of internalized collagen, and (5) Endo180 is expressed by both human and rodent hepatic stellate cell lines. These findings have not been described previously. We cannot, however, rule out the possibility that Endo180 mRNA might be expressed at very low levels by the majority of quiescent HSCs or at higher levels by a minor subset of quiescent HSCs. The increase in the ability of HSCs to endocytose collagen was strikingly similar to the increase in expression of Endo180, as transdifferentiation proceeded over time. This relation between endocytic activity and receptor expression, which was also seen in established hepatic cell lines, supports earlier observations indicating that Endo180 is the main and maybe the only receptor mediating endocytosis of collagen in activated HSCs . The functional importance of culture-induced up-regulation of Endo180 in the setting of liver injury is not clear at present. However, Endo180, if expressed by activated HSCs in injured livers, may have several potential functions in hepatic wound healing. The MMP-mediated cleavage of the fibrillar collagens results in the production of fragments which are rapidly denatured. Although collagen fragments thus formed can be further degraded by gelatinases [45, 46], receptor-mediated endocytosis and lysosomal degradation of internalized collagen fragments by Endo180-expressing cells may also play a role in regulating the extracellular levels of collagens during tissue remodelling. Indeed, a recent study showed that collagen fragments generated by collagenase activity and heat-denatured collagen are taken up much more efficiently than intact collagen by Endo180-expressing cells . Findings showing that Endo180 is highly expressed in tissues undergoing active ECM remodelling (such as during embryological development [5, 47], during early postnatal bone and cartilage growth [9, 48], and during gingival wound healing ) also points to its essential role in degradation of ECM. Moreover, several studies have shown that up-regulation of Endo180 in tumour cells  and stromal cells such as myofibroblasts is highly correlated with the malignancy of various carcinomas [51–53], and there is further evidence that Endo180-mediated collagen clearance accounts for tumour progression [50, 51, 53]. Endo180 expressed by activated HSCs may also play a role in promoting tumour invasion in the liver, given the fact that activated HSCs are a component of the stroma of hepatocellular carcinomas and can contribute to the tumour progression [54–56]. The present study has identified Endo180 as a protein that is up-regulated in association with HSC activation during primary culture. These in vitro data suggest that Endo180 may play a role in matrix collagen turnover. In addition, Endo180 could be a good marker of culture-activated HSCs. Further investigation will be required to determine if Endo180 expression is similarly up-regulated by activated HSCs in the context of liver injury. Polyclonal rabbit anti-Endo180 antibody was a gift from Dr. Clare M. Isacke (Breakthrough Breast Cancer Research Centre, The Institute of Cancer research, London, UK). This polyclonal antiserum was initially raised against purified human Endo180  and we have previously shown that it also reacts with rat Endo180 . Anti-desmin antibody (Cat. No. D-1033, mouse monoclonal), anti-α smooth muscle actin antibody (Cat. No. A-2547, mouse monoclonal), anti-glial fibrillary acidic protein antibody (Cat. No. G-2969, rabbit polyclonal), and anti-β-actin antibody (Cat. No. A-5316, mouse monoclonal) were obtained from Sigma. Secondary horseradish peroxidase-conjugated antibodies were obtained from GE Healthcare. Collagenase H, DNase I and protease inhibitors were obtained from Roche. Pronase E was obtained from MERCK. Culture media and Hank's balanced salt solution were from Gibco BRL (Invitrogen). Fetal bovine serum (Cat. No. A15-151) was obtained from PAA Laboratories GmbH. Antibiotics were obtained from BioWhittaker. Bovine serum albumin, collagen from calf skin (Cat. No. C-3511), and Optiprep (60% w/v) were obtained from Sigma. All other chemicals and reagents were obtained from Sigma unless otherwise specified. Animals received human care according to the guidelines of University of Oslo. Male Wistar rats, weighing 650 to 800 g, were used in experiments. HSCs were prepared by in situ pronase/collagenase perfusion at 37°C and density gradient centrifugation as described  with some modifications. Briefly, the animal was anesthetized with pentobarbital and the liver was perfused via the portal vein for about 10 min with calcium-free/magnesium-free Hank's balanced salt solution (HBSS) without phenol red. The liver was then removed and perfused with 0.35% pronase in HBSS containing calcium and magnesium and phenol red for about 20 min. This was followed by perfusion in a re-circulating system with a mixture of 0.035% collagenase and 0.1% pronase in HBSS for 20 min. Thereafter, the digested liver was suspended in HBSS containing 0.015% DNase and filtered through a sterile 100 μm nylon mash. The filtered suspension was divided in four 50-ml centrifuge tubes and centrifuged at 540 × g at 14°C for 7 min. The pellets were then re-suspended in HBSS containing DNase and centrifuged as described above. This was repeated once and the pellets of non-parenchymal cells were pooled and re-suspended in HBSS. The cell suspension was then mixed with 29% Optiprep solution in HBSS (to give 11.6% Optiprep), divided in two 50-ml centrifuge tubes and then overlaid with 5 ml HBSS containing 1% BSA and centrifuged at 1400 × g at 14°C for 23 min in a Eppendorf centrifuge (5810 R), without brake. After centrifugation, the interface layer was collected and washed twice in HBSS. After washing, the cells were re-suspended in Dulbecco's Minimum Essential medium (DMEM) containing 2 mM L-glutamine, 25 mM HEPES, 4.5 g/L glucose, penicillin (100 U/ml), streptomycin (100 μg/ml), and 18% fetal bovine serum (FBS), and counted. The cell viability was over 95% as determined by the trypan blue staining. Cells were cultured on 10 cm dishes (Costar) at a density of 3 × 106 cells/dish (for extraction of total protein and total RNA) or 6-well culture plates (Costar) at a density of 2 × 105 cells/well (for endocytosis experiments). The cells were incubated at 37°C in a humidified atmosphere containing 5% CO2 in air. The following day, the cells were washed twice in HBSS to remove non-adherent cells and fresh growth medium containing 18% FBS was added. One day later (day 2), the cells were washed again as above and incubated with growth medium containing 10% FBS for the next 5 days. In some experiments, the cells were activated for 8 days in 75 cm flasks, trypsinized, recovered by centrifugation and then sub-cultured (first passage) in 10 cm dishes or 6-well plates and used after 3 to 5 days. Oil Red-O staining was used to detect cytoplasmic lipid droplets. Cells were washed with phosphate-buffered saline (PBS), pH 7.4, and fixed in 1% paraformaldehyde at room temperature for 60 min. The cells were then washed with 50% isopropanol and stained with 0.3% Oil Red-O for 10 min at room temperature, washed with PBS, and then the nuclei were stained with hematoxylin for 2 min. Finally, the cells were washed with PBS and fixed with 1% PFA before they were photographed. Microphotographs were taken using a light microscope (Leica DMIL) connected to a digital camera (Wetzler GmbH). Radio-labelled tyramine cellobiose (125I-TC) was prepared by reacting TC with Na125I (Perkin-Elmer) in Iodogen tubes (Pierce) and was then coupled covalently to heat-denatured collagen (5 mg in 500 μl borate buffer, pH 9.4) after activating the 125I-TC with the cross-linking agent cyanuric chloride, essentially as described by Pittman et al . The labelled protein (125I-TC-collagen) was dialyzed against PBS using 10000 Da dialysis cassettes (Pierce Biotechnology) to remove non-coupled 125I-TC. Cells were washed three times with HBSS and then 1 ml DMEM containing 1% bovine serum albumin (BSA) was added. After pre-incubation for 45 min at 37°C, cells were incubated with 125I-TC-collagen at 37°C. For experiments where inhibitors were used, cells were either treated with inhibitor or control amounts of vehicle (DMSO) during the last 15 min of the pre-incubation period. At the end of the incubation period, the medium was removed and the cells were washed three times with ice-cold PBS, scraped in lysis buffer (0.1% SDS, 0.1 N NaOH), transferred to tubes and then precipitated with trichloracetic acid and BSA at final concentrations of 10% and 0.5%, respectively. Cell lysates were kept on ice for 15 min and centrifuged to separate acid-soluble fraction from the acid-precipitable fraction. Cell-associated acid-soluble and acid-precipitable radioactivities were measured using a γ counter. It should be noted that the 125I-TC moiety formed after degradation of 125I-TC-collagen is not released to the medium but remains trapped in degradative compartments . Total uptake was calculated by subtracting radioactivity bound to the cell surface at 4°C from total cell-associated radioactivity measured at 37°C and expressed as the sum of acid-precipitable and acid-soluble radioactivity. Radioactivity bound to control wells (wells containing no cells) was less than 0.1% of the total radioactivity added to the medium. On each of days 1, 2, and 3 cells were counted directly in duplicate wells under an inverted microscope. On days 4, 5, 6, and 7 duplicate wells were trypsinized and cell number determined by use of a hemocytometer. At different time points, cultured HSCs were washed three times with PBS, scraped, spun down, and cell pellets were frozen at -20°C until preparation of total protein. Total protein was prepared from frozen cell pellets by addition of sample-loading buffer (Tris buffer pH 6.8, 2% Sodium dodecyl sulfate (SDS), and 10% sucrose) containing protease inhibitors. In some experiments cells were washed and lysed directly in sample-loading buffer containing protease inhibitors and stored at -20°C. Cell lysates were kept on ice for 30 min with occasional vortexing, boiled for 7 min, centrifuged, and protein concentration in the clarified lysates was determined using the BCA Protein Assay kit (Pierce). Equal amounts of protein (30–50 μg) in cell lysates were separated by 7.5% SDS-polyacrylamide gel electrophoresis (SDS-PAGE) under non-reducing conditions and electrotransferred to a polyvinylidine difluoride membrane (Millipore). The membrane was blocked in PBS containing 0.1% (v/v) Tween-20 (PBS-Tween) and 5% skim milk for 1 h at room temperature and then blotted with rabbit anti-Endo180 polyclonal antibody for 1 h. After several washes with PBS-Tween, the membrane was incubated for 1 h with horseradish peroxidase (HRP)-conjugated anti-rabbit IgG to detect bound anti-Endo180. The membrane was washed with PBS-Tween and secondary HRP-conjugated antibody was visualized by ECL detection system (GE Healthcare) and exposed to film. The membrane was stripped for re-blotting with β-actin and one or two marker proteins. At different time points, cultured HSCs were washed three times with PBS, scraped, spun down, and cell pellets were frozen at -20°C until preparation of total RNA. Total RNA was extracted from frozen cell pellets using Versagene RNA Cell Kit (Gentra Systems) according to the manufacturer's instruction. One microgram total RNA was reverse transcribed using SuperScript II RNase H- Reverse Transcriptase (Invitrogen). After cDNA synthesis, the cDNA mixture was used as template for PCR. Routine PCR was performed using DyNAzyme (Finnzymes) and the primers (rat/mouse Endo180 forward 5'-CAC GGG AAG CCG TGT ACT AT-3' and reverse 5'-CCT CCA GGA CAG TGT GGA TT-3', human Endo180 forward 5'-GGA ACC CAA CAT CTT CCT CA-3' and reverse 5'-CCG GTC ACA CTC ATA CAT GC-3', and β-actin forward 5'-AGC CAT GTA CGT AGC CAT CC-3' and reverse 5'-TCT CAG CTG TGG TGG TGA AG-3') were designed by the Primer 3 Output program http://frodo.wi.mit.edu/cgi-bin/primer3/primer3_www.cgi. LX-2, a human HSC line, was provided by Dr. Scott L. Friedman (Mount Sinai School of Medicine, New York). The murine M1-4 HSC line was provided by Dr. Wolfgang Mikulits (Institute of Cancer Research, Medical University of Vienna, Austria). The rat HSC lines, BSC and MFBY2, were provided by Dr. Hidekazu Tsukamoto (Keck School of Medicine, University of Southern California, Los Angeles) and Dr. Sato Kenzo (School of Life Science, Tottori University Faculty of Medicine, Japan), respectively. The murine and rat HSC lines were cultured in DMEM containing 10% FBS (Gibco BRL, Invitrogen) and kept at 37°C as described for primary cultures. LX-2 cell line was maintained under identical conditions but in Medium 199 instead of DMEM. For Western blotting and RT-PCR analyses, the cells were cultured to 80–90% confluency in 10 cm dishes and harvested as described for primary culture HSCs. For endocytosis, cells were cultured in 12-well plates at 1 × 105 cells per well twelve hours before the start of experiments and endocytosis was measured as described above. Duplicate wells were trypsinized and cell number of each cell culture was determined by a hemocytometer. We thank Dr. Clare M. Isacke for kindly providing anti-Endo180 antibody. We also thank Dr. Scott L. Friedman, Dr. Wolfgang Mikulits, Dr. Hidekazu Tsukamoto, and Dr. Sato Kenzo for kindly providing hepatic stellate cell lines. This work was supported by the Norwegian Cancer Society. SAM performed liver perfusion and cell preparations, carried out Western blot studies, endocytosis experiments and O-red-Oil staining and drafted the manuscript. MSF participated in the design of the study, performed RT-PCR analysis, and has been involved in drafting the manuscript. TB defined the research theme, helped to draft the manuscript and made substantial contribution to its revising. All authors read and approved the final manuscript.